You can get two gadgets when you apply for a postpaid plan. 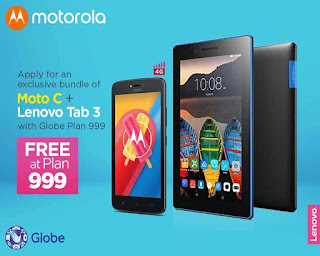 With Globe, you can get the exclusive bundle of Moto C (4G) plus Lenovo Tab 3 at Plan 999. Not just the gadgets, you also have monthly mobile internet, text to all networks, call to Globe/TM free Facebook and the free 6-month subscription to Netflix. For only 999 pesos monthly, you can enjoy the brand new Android Moto C 5-inch smartphone and the 7-inch tablet. You can use it to watch videos, stream music, play games, take photos and other task you want. Here’s what you get when apply for Globe Plan 999 exclusive 2-in-1 bundle. Aside from free Moto C4 and Lenovo Tab 3, you’ll also get the services below. To apply, you can visit your nearest Globe store or call their hotline for faster processing.